Today I'll be mixing things up and reviewing a movie. And not just a movie, but a movie I watched before reading the book. It happens. 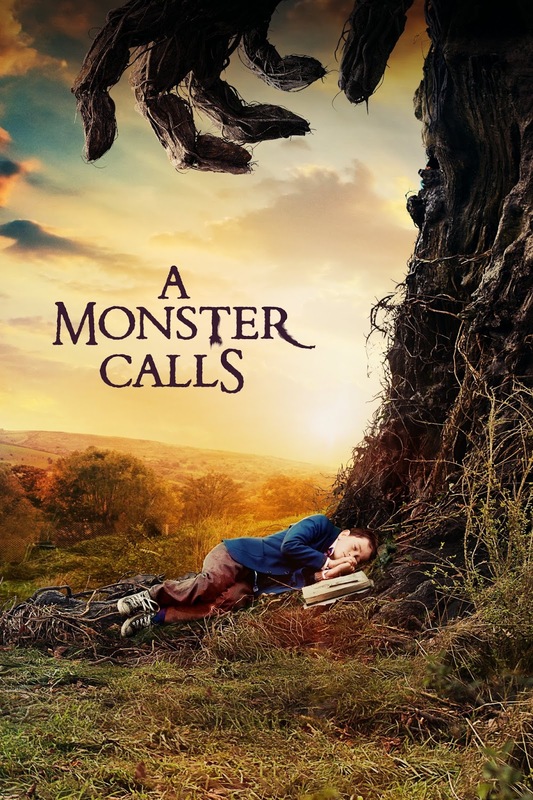 A Monster Calls was released in theaters Christmas 2016, and while critics loved it and raved about it, audiences paid little attention. At the box office, it barely broke even. I knew about it only because I regularly read Roger Ebert reviews, and after seeing that author Patrick Ness wrote the screenplay and Spanish filmmaker J.A. Bayona (of The Impossible) directed it, I knew it held promise. But I didn't know the story. I didn't pay much attention. Then, a few months later, I shelved this movie at the library the second it came in on DVD. But the cover stopped me. Everything about it drew me in. The colors somehow soft and vibrant at the same time. The sleeping little boy. The hand of the tree. Why was the boy asleep under this tree? What was the monster, and why did it call? I was struck so deeply, I knew I would not be able to die happy until I had watched this movie. So it came home with me. Immediately. And here I am five or six months later, still thinking about it. This entire movie consists of four human characters: a young boy named Conor, his cancer-stricken mother, his fussy and grumpy grandmother, and his kind but absent father. (The fifth character is the giant, talking, metaphorical tree, or monster, of Conor's imagination.) We are in Conor's mind the entire time as he deals with anger, loss, and loneliness. He was played by 12-year-old Lewis MacDougall in only the second role of his life, and he was perfect. Something about him was so watchable. He was in every single scene, often alone, and after a few moments, I wanted to spend two hours with this boy. That is a quality of an actor that is so important, but so often overlooked. This boy was twelve and he nailed it. J.A. Bayona knows how to cast kids. All four of the actors did fine, understated jobs, carrying the heavy emotions without dropping them and letting the film become melodrama. The entire movie is a work of art, as beautiful and creative as Conor's artistic mind. Every new shot is a miniature masterpiece. It is also not a movie concerned with staying securely within one genre. It is a fantasy film, but it is not an action film. It takes its time, content to let Lewis MacDougall's eyes convey far more feeling than any chaotic, action-packed script ever could, and the result is as visually appealing as it is brutally emotional. I wanted to stay in this film, to linger in its watercolors, its foggy European skies, its wise trees and peaceful graveyards, its gentleness and calmness. It feels like a fairy tale, but it does not promise us that everything will end happily ever after. Instead, it tells us through Conor's father that "most of us get messily after...and that's all right." And maybe it can even be beautiful.